Last week, the Paris climate agreement cleared its final hurdle, when the European Union formally signed on. With the support of 73 nations accounting for 57 percent of global carbon emissions, the deal enters legal force on November 4th. So what does that mean, and how soon do we kick our addiction to fossil fuels? First, for those who’ve forgotten about Paris climate agreement—it’s okay, it happened a while ago, long before our memory banks became clotted with clumps of Ken Bone’s sweater—here’s a brief refresher. Approved by 195 nations in a UN summit last December, the Paris agreement is an international consensus to try and forestall the climate apocalypse by limiting the planet to 2 degrees Celsius of global warming, with a “reach goal” of 1.5 degrees, which could help us save a few coral reefs, too. To meet this target, every nation on Earth is expected to start cutting greenhouse emissions and begin shifting to renewable energy sources by 2020, if not sooner. By the 2070s or so, the entire global economy will be running off a mix of wind, sunshine, nuclear power, and maybe some more speculative energy sources like hydrogen and fusion. Practically and in the short-term, most nations will work toward their “nationally determined contributions” (NDCs). These are voluntary emissions reduction pledges submitted in advance of Paris last year. 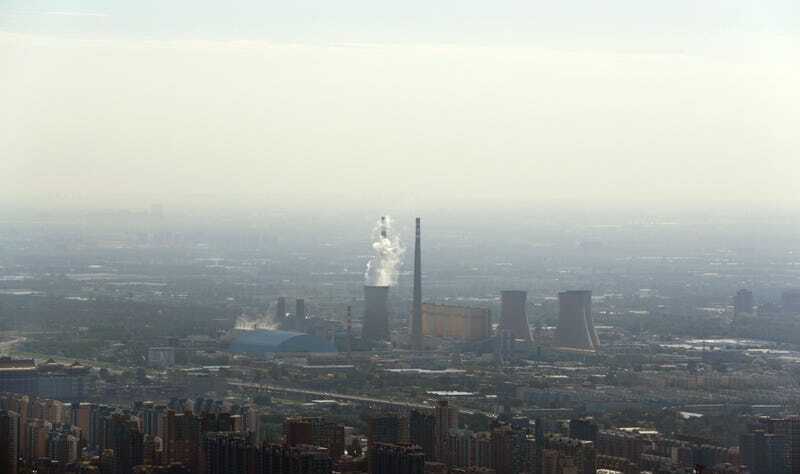 The United States has pledged to cut carbon emissions 26 to 28 percent by 2025, the EU has agreed to reduce emissions 40 percent by 2030, and China is aiming for its emissions growth to peak by 2030 if not sooner. Countries with major forest resources, like Russia and Brazil, plan to offset future emissions by curbing deforestation. A full list of NDC pledges by country can be found here. Here’s the good news: most wealthy nations are already walking the path toward carbon neutrality. “When you look at global emissions, the developed world has stabilized,” Doug Vine, a senior energy fellow at the Center for Climate and Energy Solutions told Gizmodo. For the West, it’s a matter of bringing stable-but-high emissions down. There are signs that this is happening. Last year, the Obama administration introduced new rules to cut power plant emissions 30 percent by 2030. If upheld by the courts, the Clean Power Plan will be a cornerstone of America’s effort to decarbonize over the next fifteen years. Even if the plan doesn’t survive in its current form, the renewable energy market will continue to expand organically as the price of wind and solar power plummet. China, meanwhile, is growing its wind and solar capacity at a staggering rate, installing vast solar farms in the Gobi desert and tremendous wind turbine fleets in its western provinces. In Australia, 1.5 million households are generating electricity straight from the sun. In Denmark, energy output soars past national demand on gusty days. But despite recent progress, the world is not yet on track to stay below 2 degrees Celsius of warming, with recent studies suggesting that limit could be breached by 2050. And the 1.5 degree reach goal is looking nearly impossible without futuristic carbon capture technology. A new paper by prominent climate scientist James Hansen concludes that global temperatures are likely to clock in 1.25 degrees above the pre-industrial average in 2016. With an additional half a degree of warming locked in as the oceans equilibrate with the atmosphere, we could see our first 1.5 degree warming year within a decade. Karl Hausker, a Senior Climate Fellow at the World Resources Institute, sees three major action areas for achieving net zero emissions by the late century. First, a focus on converting the world’s oil and gas-powered engines to electricity. “That means electrifying transportation as much as possible, making water heaters and space heaters electric, and converting many industrial uses of fossil fuels to electricity,” he told Gizmodo. With more and more of our energy needs met by plugging in rather than filling a tank, carbon emissions become streamlined into point sources: power plants. Which brings us to sweeping energy transformation goal number two: generating all electricity through zero or low carbon sources. Critically, this means ensuring that developing countries adopt clean energy technologies instead of building enormous new coal-fired plants in the decades to come. Again, as per the Paris agreement, the developed world is expected to lend a hand. “Basically, the world needs to come together and ensure more low and zero carbon technology are available in the developing world,” Vine said, adding that those technologies could include not just wind and solar, but nuclear power and carbon capture and storage (a controversial and technologically immature method of cleaning up fuel-burning plants). Third, we need to try to be as efficient as possible in everything we do, whether it’s flying across the world—the UN took a first, belabored stab at regulating airline emissions last week—or designing buildings that use less electricity through passive heating and cooling. It also wouldn’t hurt to tackle low-hanging fruit, like hydrofluorocarbons (HFCs). Used in refrigeration, building insulation, and as flame retardants, HFCs became prevalent in the 1990s, after the Montreal Protocol banned their more infamous cousins, the ozone-destroying chlorofluorocarbons (CFCs). While the use of HFCs instead of CFCs has allowed the giant hole in our ozone layer to heal, HFCs have also made an outsized contribution to global warming, by packing 1,400 times the heat-trapping punch of CO2. By some estimates, eliminating HFCs could prevent up to half a degree of warming by mid-century. One the Paris agreement is in effect, it’ll take any country four years to formally withdraw. But there are still many ways a coal-loving administration could undermine progress. Future armed conflicts and unforeseen natural disasters are, of course, always an existential risk to international cooperation, too. Still, with the first ambitious global framework for tackling climate change on the cusp of being activated, there’s more reason to be hopeful about a high-tech, low-carbon future than ever before.